Christopher Bell celebrates after winning the 2015 NASCAR Camping World Truck Series race at Eldora Speedway. Bell is counting on his experience racing on dirt in Wednesday’s truck race at Eldora. 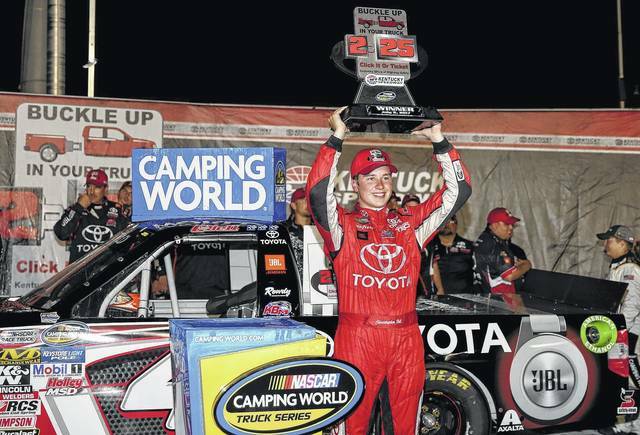 Christopher Bell celebrates after winning a NASCAR Trucks Series on July at Kentucky Speedway in Sparta, Ky. Bell is counting on his experience racing on dirt when the series comes to Eldora on Wednesday night. ROSSBURG — Unable to test their trucks on dirt prior to the NASCAR Camping World Truck Series race at Eldora Speedway, drivers are considering an array of options to prepare for Wednesday’s race. Rules for NASCAR’s top three levels – the Monster Energy NASCAR Cup Series, XFINITY Series and Camping World Truck Series – prevent teams from participating in any testing with their vehicles unless it’s sanctioned by NASCAR. The rule is designed to contain costs and ensure parity throughout the series. Eldora Speedway’s fifth annual Dirt Derby is the only top series NASCAR event that is contested on dirt. 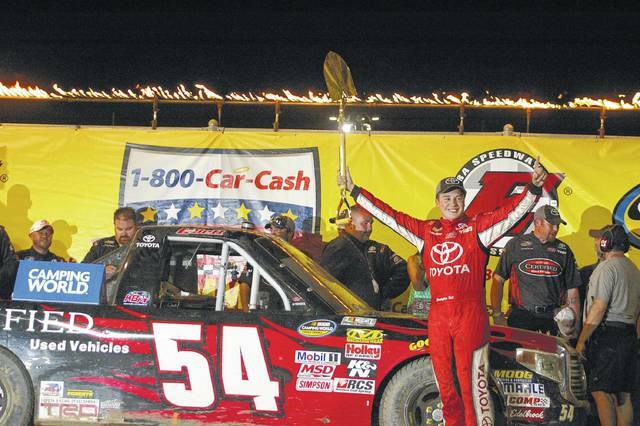 The inaugural truck race at Eldora in 2013 marked NASCAR’s first dirt race since 1970. Being the series’ only race on dirt, many of the drivers don’t have much experience racing on the surface and would welcome a chance for testing. Some drivers have found ways to get on the dirt – just not in their trucks. Christopher Bell, the champion of the 2015 NASCAR truck race at Eldora, competed in this past weekend’s Kings Royal in preparation for Wednesday’s race. Bell expects the experience of running on Eldora’s dirt will help him even though there’s a big speed difference between sprint cars and trucks. “The Kings Royal, I’ve been able to do that the last couple of years before the truck race, and it’s been a huge advantage for me because like Chase (Briscoe) mentioned before, sprint cars are so fast. And the trucks at Eldora are relatively slow,” Bell said. “So quick time this weekend in the sprint cars is going to be in the 12-second bracket and when we go back in the truck it’s going to be in the 20-second bracket. So clicking around there in a sprint car, getting laps in a sprint car, it won’t really help as far as track conditions because the conditions will be totally different. Unlike Bell, Sauter doesn’t have much experience racing on dirt. His plan is to test a street stock on a dirt track in Wisconsin. The street stock is a similar size to a truck, which Sauter thinks will help his preparations. Nemechek, who like Sauter lacks extensive dirt racing experience, agreed that practicing in a stock car wouldn’t help him much. “Like Johnny said, I think if you were to go run a dirt late model or something like that, it’s really not going to help you just because of the weight difference,” Nemechek said. “So it’s definitely a lot of difference. I definitely think that going to run a street stock could help Johnny. We’re not really doing anything to compare cars to the trucks. We’re not going to test anything. Dirt track veterans like Bell and Briscoe said along with the differences in cars, various tracks have different conditions, and Eldora presents some of the toughest. Eldora has a very fast track, Briscoe said, which is why his father didn’t want him competing there while he was learning to race. With all the challenges Eldora presents, the dirt veterans and dirt novices all agreed that the drivers with dirt backgrounds will have big advantages entering Wednesday’s race. Briscoe is counting on his dirt experience to put him in contention for a victory.